In the 19th century, and probably even earlier, white fish throughout the length and breadth of Scotland, were caught by baited hook and line. The boats used were wooden and un-decked and usually measured between twenty five and forty feet in length. Each boat normally had a crew of around six men; four to pull the oars, one to set the lines and one to land the catch. A mast and sail were sometimes used to free up the oarsmen to assist in the onboard work. There were two types of line fishing. 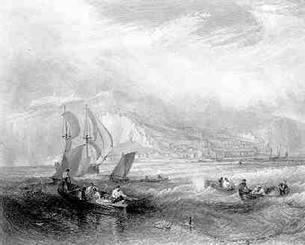 The “Great Line” fishing took the boats as far as forty miles offshore necessitating a few uncomfortable nights at sea in all weathers, whereas the "Small Line" fishing took place much closer to shore and usually allowed the men to return home during the same day. The lines that were used in both types of fishing were of similar construction and any variations between them were slight. The main line (the Back) consisted of a thick piece of brown backed string cord and would vary in length, although an average size would be a line of approximately sixty fathoms length. Attached to this string were snoods - shorter pieces of thinner cord spaced at intervals of approximately forty inches along the line. To the snoods were fixed horse hair “tippings” around ten inches in length onto which the hook was whipped with strong thread. The snood was bent onto the line with a knotted clove hitch and sufficient end was left to turn back around to form a kind of plait which prevented ravelling and twisting. Some lines could carry as many as one thousand individual hooks. The head of the line went over the side first, shot across the tide so that the snoods would drift away from the main line, and this was anchored to the sea bed by a plain unhooked line (a Tow), which was held in place by a heavy stone or anchor. A buoy marked the position of the Tow on the surface. The boat was then allowed to drift for a time before hauling in the line to be stowed in a wicker scull or basket. The fish that were targeted and caught were mainly cod, haddock, ling and plaice. This method of fishing was quite labour intensive, particularly in the preparation of the lines prior to putting out to sea which involved the “redding” and “sheillin-and-baiting” of the lines, tasks that, invariably, were performed by the local women-folk. The pillars of the fishing communities were the women who were the stalwarts behind their men and at the fore in all business and domestic matters. They gathered the bait, baited the lines, carried the creels and fishing gear, brought the fish to market which was usually many miles away and did the selling. On occasions it was the men who replaced the creels on the women’s backs! This was not exploitation but a necessary act because the men may have had to spend days at sea, and exposure to the elements in wet clothes heightened the risk of illness which was something that no fisherman wanted. The men had to stay dry because illness meant no fishing and without any fishing there was no income so this meant that the womenfolk had the onerous task of carrying the men on to their boats! Oh yes, on top of all this hard work the women also had families to rear and children to look after. 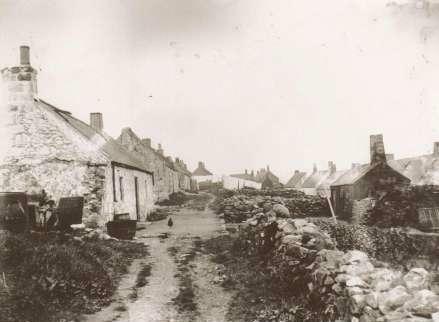 During the 1800’s this was the way of life of the fisher-folk of Findon, Portlethen and Downies and this way of life, in general, remained unchanged until the beginning of the 20th century.